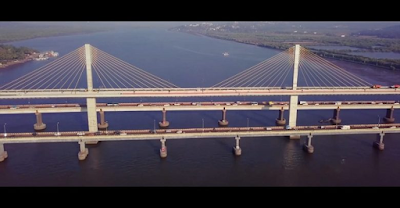 The bridge will support and sustain burgeoning traffic in Panjim. It will facilitate routing of Mumbai bound traffic coming in from Bangalore via Ponda route and Old Goa towards NH-17, bypassing the main Panjim City. It will also help overcome the bottlenecks caused at Panaji KTC Circle, and Panaji Entrance as the same route is currently being used by local traffic as well as NH-17 Highway bound traffic. About 66,000 vehicles use this route every day, leading to hours of congestion, especially during the peak tourist season in Goa. The bridge will also be an aesthetically pleasing landmark for tourism development in the state of Goa. 1,00,000 m3 of high strength, high performance concrete, enough to fill 40 Olympic size swimming pools, was used for making this fully indigenously built bridge. Additionally, 13,000 MT of Corrosion Resistant Reinforcement Steel – the weight of 20,000 cars, 32000 square meter of Structural Steel Plates - enough to cover 6 soccer fields, 1800 km of High Tensile Pre-stressing Steel strands – equal to distance from Goa to Delhi, 265 Nos of Spherical Bridge Bearings, and 88 High Tensile Strength Cables in State-of-the-art Single Plane Harp type Cable Stay System equipped with real-time Force Monitoring technology were used for this 2,50,000 tons heavy bridge, which is equal to the weight of 570 Boeing-747 Jumbo jets.